We are on the brink of a revolution in healthcare. AI is making the drug discovery process >100X faster and cheaper, and 90 percent more likely to succeed in clinical trials. Mobile health is predicted to become a $102 billion market by 2022, putting a virtual doctor, on-demand, in your back pocket. 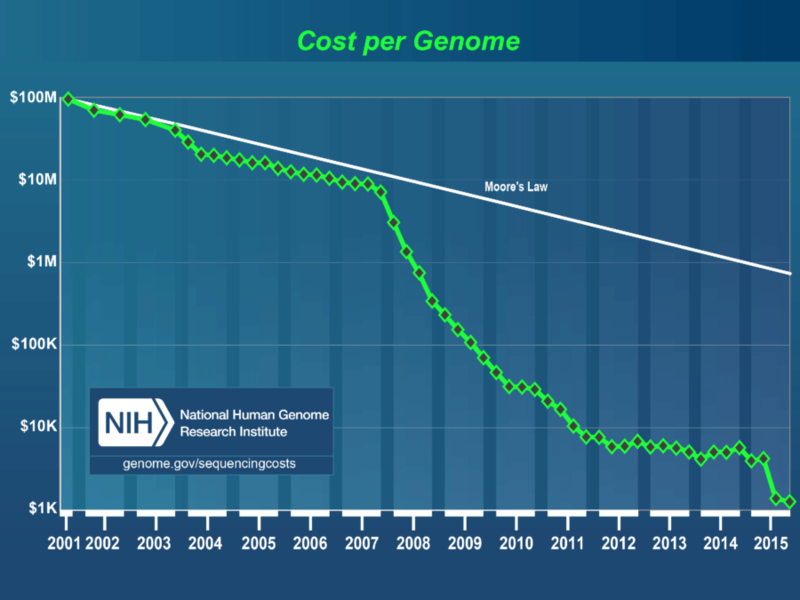 And the cost of sequencing your genome (3.2 billion base pairs) has decreased 100,000-fold over 13 years, a staggering speed that is 3 times faster than the rate of Moore’s Law. Currently, research focuses on one-size-fits-all solutions. Clinical trials aim to discover therapies for the general population—and can only introduce them after years of expensive initial research, lab testing, human testing clearance, multiple phases of patient testing and maybe ultimate approval. But what if all treatments were targeted at your individual genome, from lab testing to ready product, and at a lower cost? Using their powerful deep learning systems, NVIDIA aims to tailor treatments to an individual’s genomic makeup. Others, like a team at the University of Toronto, are building genetic interpretation engines to pinpoint cancer-causing genetic mutations in individual patients. Similarly, researchers at UNC’s Lineberger Comprehensive Cancer Center use cognitive computing to identify individually relevant therapeutic options based on one’s genetic profile. But this is only the beginning. 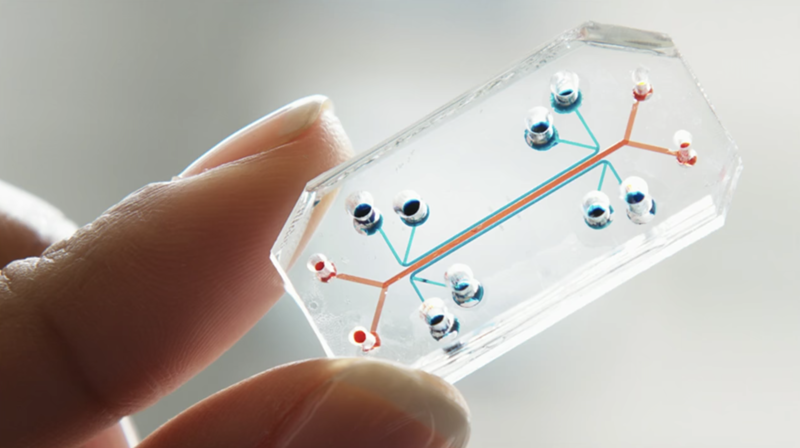 Take Harvard Wyss Institute’s organs-on-chips. 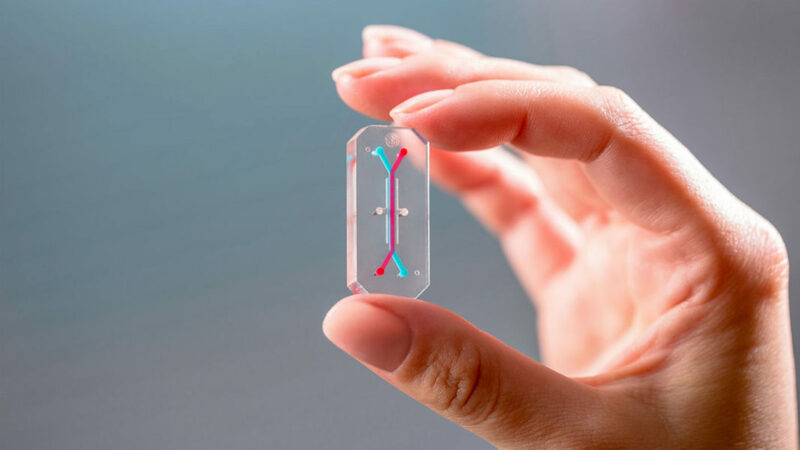 Containing microfluidic channels with living human cells and mechanical mimicry of an organ’s microenvironment, the Wyss Institute’s organs-on-chips can serve as micro artificial hearts, lungs, intestines and kidneys, among many other organs. In the future, these could be your cells on a chip, tested with treatment after treatment until the right one sticks, tailored exactly to your genetic makeup. But it doesn’t stop at genetically personalized treatments. Welcome to personalized diets. Each of us has about 40 trillion microorganisms that occupy our gut, and each microbiome —like our DNA—is distinct. Through a simple home kit, Viome applies machine learning to analyze your microbiome, then makes optimal, personalized nutritional recommendations for your gut. (1) mHealth (or Mobile Health) has already grown beyond a $23 billion market, and by some estimates will surpass $102 billion by 2022. Step aside, WebMD. New diagnostics and screening apps are also beginning to empower the next generation of patient-doctors. In addition to phone apps and add-ons that test for fertility or autism, the now-FDA-approved Clarius L7 Linear Ultrasound Scanner can connect directly to iOS and Android devices and perform wireless ultrasounds at a moment’s notice. It’s no wonder the healthcare industry suffers from a shortage of doctors. Medical training is not only expensive, but its conventional methods also severely limit scalability. With virtual and augmented reality, however, gone are the days of peering over a surgeon’s shoulder to learn from another’s experience. Why not perform surgery on an annotated, virtual 3D body from anywhere in the world, for minimal cost, and do no harm? Companies like Echopixel and 3D4Medical are achieving this delocalization and hands-on training with remarkable style, translating 2D scans and anatomy into live AR and VR patients. Welcome to the age of intravenous nanomachines, electronic implants and pill-embedded sensors. While wearables have long been able to track and transmit our steps, heart rate and various other health factors, smart nanobots and ingestible sensors will soon be able to monitor countless health parameters and even help diagnose disease. In last year’s Qualcomm Tricorder XPRIZE, we were proud to grant $2.5 million in prize money to the winning team, Final Frontier Medical Devices. Using a group of noninvasive sensors that collect data on vital signs, body chemistry, and biological functions, Final Frontier integrates this data in their powerful, AI-based DxtER diagnostic engine for rapid, high-precision assessments. Their engine combines learning from clinical emergency medicine and data analysis from actual patients. IoT-connected sensors are also entering the world of prescription drugs. Just this winter, the first sensor-embedded pill—Abilify MyCite—was approved by the FDA. Digital pills like Abilify will now be able to communicate medication data to a user-controlled app, to which doctors may be granted access for remote monitoring. 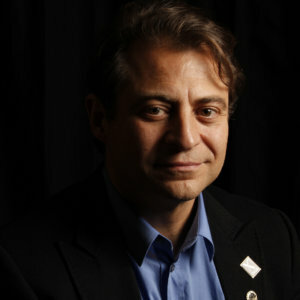 But nanobots and IoT-connected sensors get a lot more exciting when they converge with 3D printers, AI supercomputers, and the power of big data. Take a minute to imagine this unprecedented convergence: Nanobot sensors flowing through your bloodstream monitor different health parameters, measuring nutrient levels and keeping an eye on your cholesterol. As data flows in, these connected sensors transmit your health data in real time to a remote AI-powered supercomputer geared with all your genomics, microbiome, and medical history data—access secured via blockchain, of course. As abnormalities are detected, this AI-driven doctor sifts through tomes of data to identify an optimal, personalized treatment based on your genetic profile and real-time health data. Once vetted and approved, a prescription arrives at the dashboard of your in-home medical 3D printer. With customized dosage, your 3D printer separates the drug’s active ingredients with micro-barriers and embeds a printed sensor to monitor variations in drug release and effectiveness. Feedback is instantaneously communicated through IoMT, and AI again improves its personalized medicine for future treatment. You might think AI medical powerhouses and autonomous sensors leave human doctors out of luck. But many digital healthcare startups are in fact redefining and elevating the role of our doctors. As medical AI enterprises like Microsoft’s Healthcare NExT and IBM Watson Health bring incredible power to diagnostics, drug discovery, and genetic therapy development, doctors may be freed to take on consultative roles—educating patients, performing many more remote surgeries with the help of robotics, and aiding in preventive care. (2) Abundance-Digital Online Community: I’ve also created a Digital/Online community of bold, abundance-minded entrepreneurs called Abundance-Digital.